This weekend I was lucky enough escape the Edinburgh Festivals and headed North to visit The Shieling Project in Struy, Glen Strathfarrar. The project is a social enterprise inspired by the heritage, landscapes and traditional culture of Highland Scotland, working with teachers and young people to explore the natural and cultural heritage of shieling life and its significance today. The project team has the ultimate vision of a modern shieling camp with a micro-dairy and learning centre, leading Scotland in sustainability and heritage education. The idea is simple: to explore the landscape’s past to help shape a more resilient future. Going to the shieling (àirigh in Scottish Gaelic), was a traditional practice of moving up to the high ground with livestock to live there for the summer – a journey many would have made every year. Each summer, for a long stretch of our past, young people all over Scotland would play an integral role in taking the livestock up to hill or moorland pastures, camping there in small bothies, learning about the world beyond the village. Ruins of shielings are abundant in high or marginal land in Scotland. The mountain huts generally fell out of use by the end of the 17th century, although in remote areas this system continued well into the 19th century. In some parts of the Western Isles, the tradition carried on into the 1950s. Visiting the Shieling at Struy today, young people have the opportunity to get to grips with skills from ancient to modern: peat cutting to sustainable building, Gaelic work song to tree planting. The project also offers professional learning, becoming the first organisation to be accredited by the General Teaching Council for Scotland (GTCS) to deliver a professional learning programme for teachers in Learning for Sustainability. From understanding traditional pastoral life and comparing it to the present, the project hopes to make an impact on some of the big themes of our times: food, sustainability, health and well-being. This summer has been particularly busy up at The Shieling. The project ran its first ever residential summer camp for young folk – which included basket making, peat cutting, insect chasing and bog jumping – as well as a Traditional Skills week where volunteers learnt weaving, wood working and traditional lime mortar stone work and helped put the finishing touches to the new multi-purpose learning space – a simple marquee structure with midge net and woven willow walls – in time for this weekend’s open day. On Friday night I was picked up at Inverness train station by one of the project directors – secondary school teacher Karen Marshall – and project volunteer, primary teacher Chris Knox. We ventured up to Sam’s restored cottage at the end of the track on the Struy Estate, near Beauly. 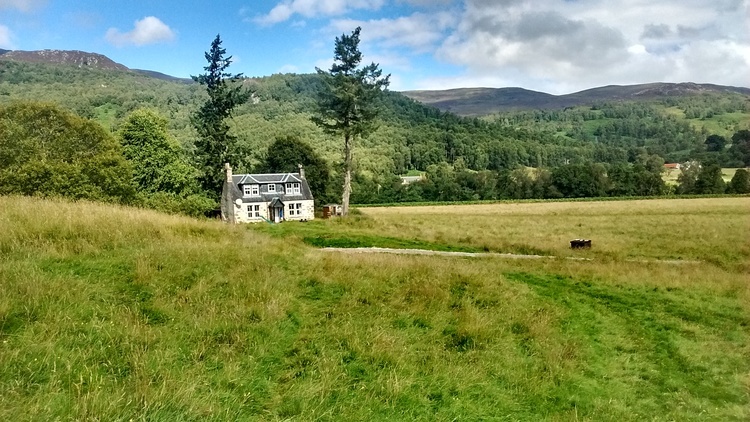 The building has not been lived in for more than 40 years (the cottage is the the former home of Pipe Major Willie Ross – regarded by many as the most influential piper of the 20th century). Next to the cottage is the byre, home to the Shieling Project’s latest addition: a Shetland cow and calf who graze on the Dunmaglass flower meadows surrounding the cottage. After a night of heavy summer rain, we awoke to a beautiful warm morning, awaiting the arrival of the day’s visitors. This included teachers, interested local people and children from the local village. Sam gave us a tour of all the new facilities – the newly finished kitchen and learning space, the compost toilets, the fire site and byre – and introduced us to the cows, the pigs, the frogs and the working horse. We also learned about the wildflowers and how they got their names – the yellow tormentil, buttercups, purple devil’s bit scabious and teeny eyebright, which was used by soldiers before battle to make their eyes look fierce. In the afternoon we heard presentations from teachers in Ullapool High School (who had completed the professional learning programme), and from teacher Jane Summers, who talked about her fantastic heritage and sustainability project with Aboyne academy in Auchtavan. I was delighted to be invited to the project by Karen and Sam to talk about the role of culture and traditional arts in the context of Learning for Sustainability – how we might create positive connections with and better understanding of the natural world through cross-curricular learning. We talked about the importance of cultural memory and reflected on the stories we tell ourselves about our environment. We also talked about music and song as a cultural expression of local place, all while listening to the stunning soundtrack of fiddler Duncan Chisholm’s album ‘Farrar’ – part of his Strathglass Trilogy, a musical representation of these ancient lands. When ‘ecology’ is mentioned, many people conjure up ideas to do with climate change, global warming and recycling. For, me it has to do with amazement, open-mindedness and wonder, with consciousness and awareness. Ecological thinking enables you to think of the deep inter-connection between people and their environment, between the local and the global and the cosmic and all levels in between, between emotions and the intellect, the rational and the non-rational. It also requires that we think temporally, or inter-generationally, of past, present and future. Ecological thinking is also inherently ethical: awareness of our inter-connectedness engenders in turn an awareness and care for each other and for the planet. The Shieling Project is a living project that embodies cultural-ecological philosophy and ethnological values (indeed, the wonderful Professor Hugh Cheape was an early advisor to the project). That is to say that this is an example of a learning project that embodies the values and approaches that are vital if we are to overcome the crises of our time: ecological degredation, alienation and loss of meaning. It can help Scotland’s young people face a variety of challenges: increasing levels of unhealthiness; physically, mentally and in their local environments, lack of opportunity to go outdoors, lack of contact with heritage and traditions of their local area, and little understanding of food production or farming. In the case of the Scottish Highlands, many young people grow up with a connection to the landscape, but know nothing the story of the place – the history, the cultural expressions of place, the poetry, the music, the language. In order for communities to flourish, we must find ways to reconnect with our places. While there are so many great things about this project, it cannot easily be put in a box. It defies classification! To pin it down would be to lose something of the magic and vitality at the very heart of it. In some ways, The Shieling project is similar in aims to a Nordic ‘folk school’ – learning traditional skills and crafts. Sam is keen to avoid any kind of reductionism and will not define the project unambiguously, however. While the learning outcomes are relevant to so many areas of the Curriculum for Excellence, the experience is about something more. For some it may be described as a spiritual experience, a transformative experience. Upon leaving, Sam lent me a book which gives an insight into where he is coming from. This book talks about ‘ecological resonance.’ Ecological learning is about the re-integration of the emotion and the intellect, about emobodied learning and radical reflection. The structures with which we resonate can be ecological, mythological and physical, drawing us out of ourselves and confirming our participation in a world that is alive. For Sam, it is not so much a question of ‘teaching environmental awareness,’ but one of allowing it to develop. This project is about creating a space for experiences, not prescribing them. It is a question of providing a context where direct experience of the natural world can become a fundamental part of the curriculum. It’s about about doing, living, being, connecting – giving people the tools to encounter the world. It’s about recovering integrity and vitality, about community, connection: a sense of place. Very noble idea inmo and there should be a lot more of these type of projects throughout Scotland,there are lots of dis-enfranchised youngsters with all the time on their hands left to wander aimlessly that could benefit tremendously from the like. This sort of thing has the potential to transform both the land and the people of Scotland but we need meaningful land reform to make it work on a wide scale. Without that we will just be tinkering at the edges and achieve nothing worthwhile. A very impressive project – ecologically sound and solid, and excellent pedagogy; there’s no substitute for experience, and especially the experiencing. Reminded me a little of some of Mitchell Thomashow’s work on ‘Ecological Identity’. I sense that those experiencing The Shieling are being helped to get in better touch with their ‘eco’. Thank you Mairi for providing sustainability educators with such a fine case study, infused with your own exquisite sensibility. And delighted to see the CHE as part of Sam’s provenance. This has made my day! Does anyone know if goats were kept in high corries? If so, it might explain the meaning of Coire an Ruigh (shieling corrie?) in Glencoe. It is high above Allt-na-ruigh (Alt na reigh on modern maps), the white cottage once owned by Hamish Macinnes, the mountaineer. Scotland’s Places includes this translation: ‘The herdsmen’ Summer residence corrie” by local people c. 1870. However, Mr MacInnes is of the opinion that the corrie is inaccessible to cattle. Excellent project. Very inspiring indeed.